By ELAINE REEVES | As Jon Healey of Pynegana Dairy explains, although Pyengana uses cheddar starters, it does not ‘cheddar’ — that is, the process of letting the curd bond together, then cutting it into loaves, and then into ‘chips’ in a cheddar mill. Instead, a Pyengana cheese is simply stirred, and does not form loaves. 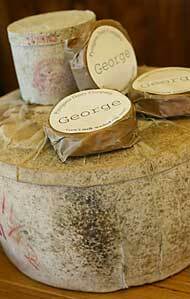 Several Tasmanian dairies make a cheddar; Pyengana Dairy is the only one that does this stirred-curd method. However, Pyengana now has a cheddar mill, so you can also look for a ‘true cheddar”. Most big cheese factories mature cheese in plastic or wax, but Pyengana cheeses are wrapped in cloth. Cloth lets the cheese breathe, and build up its own character. 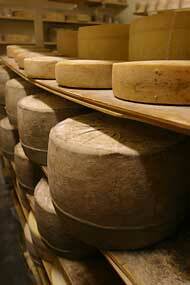 The cheese can expel some aromas or flavours and the texture is different because the cheese can dry out. A cloth-wrapped cheese is turned four times a week for the rest of its life – for maturing reasons, but also to stop it “becoming part of the board it sits on”, and it is wiped and rubbed with olive oil. “There is a lot of work in cloth-rinding, and that’s why people put cheese in all these other barriers, because then you don’t have to touch it,” says Jon. “If you get a 30 tonnes of the stuff hanging around in 20kg blocks, that’s a lot of items that have to be turned every week, and some 16-year-old girl can’t come along and turn them over.” The biggest block, an “80-pounder” weighs 40kg, and is matured for 12 or 16 months. “The bigger the body of cheese the better it is. 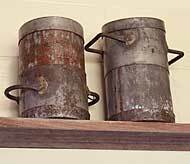 For just a few months at the start, Jon made his cheese with unpasteurised, or raw, milk. But soon, this was no longer allowed, and his parents stood him a pasteuriser. Making cheese from raw milk is not possible when milk is collected from many farms, mixed and held some time, but for small concerns, such as Pyengana, that milk their own cows, it is accepted as a perfectly safe practice everywhere — except in Australia and New Zealand. “I believe that given another five years, Pyengana will be making cheese from unpasteurised milk,” says Jon.